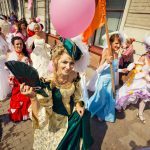 When it comes to Halloween, it is a great time for the whole family to dress up and have a great deal of fun. Since our pets are also a big part of our families, there is no reason why they cannot get in on the action too! Dog owners in particular love to dress up their dogs in cute outfits throughout the year and Halloween gives them the excuse to go all out with adorable costumes. 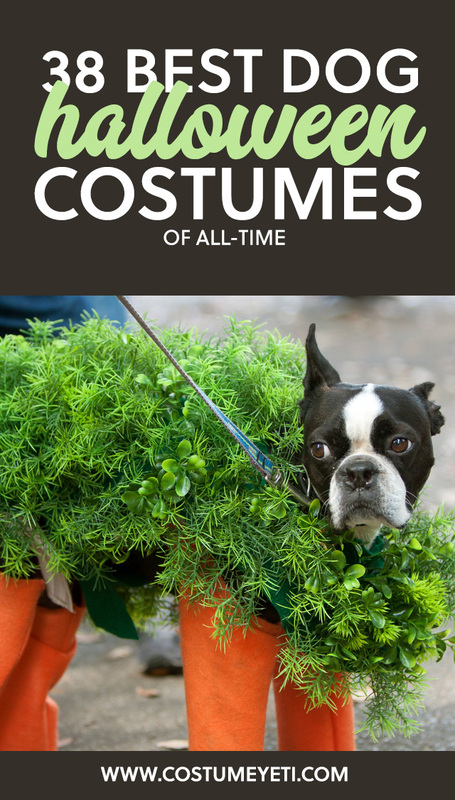 We have gathered together some of the very best dog Halloween costumes. Let’s get started with a pretty basic little costume. 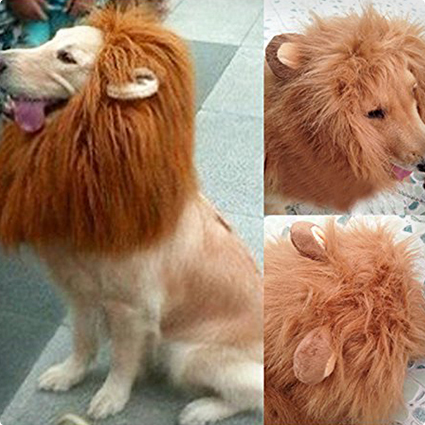 This Lion’s mane is essentially a wig for a dog! It fastens around your dogs head and neck with an adjustable closure to ensure a perfect fit and comes complete with lion ears to finish of the look. The mane is available in two different shades allowing you to get the perfect match for your pooch. This is a quick and easy way to dress your Dog for Halloween and could even be matched to your own outfit if you want to go for a Wizard of Oz theme – after all, every Dorothy needs a cowardly lion! This officially licensed DC Comics costume is just perfect if you want to bring out your dog’s inner villain just for Halloween! 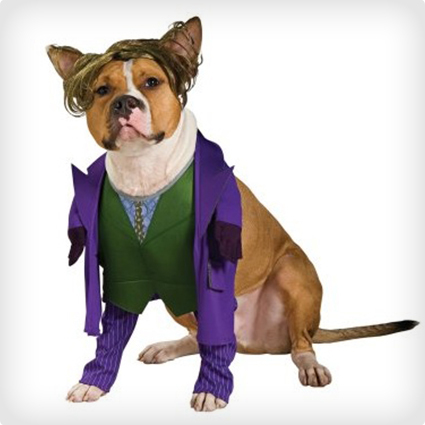 The Joker is everyone’s favourite Batman bad guy and with this cute shirt and wig your dog is bound to look the part! Again, this is an ideal outfit if you want to match your dog to your own costumes since there are lots of Batman related costumes available for humans too! Is your dog your ultimate hero? 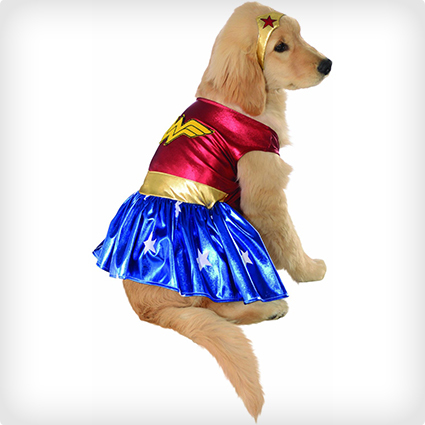 If so, let her show the world in this adorable Wonder Woman costume for dogs. The costume consists of a cute printed Wonder Woman dress in a metallic fabric and a matching headpiece to complete the outfit. Your dog will look simply fantastic in this vibrant costume which is officially licensed by DC Comics. Everybody loves an underdog, right? Well nobody will be able to resist your canine companion if you choose to dress them in this adorable number! Let your dog stand up for little guys everywhere in this adorable superhero outfit. 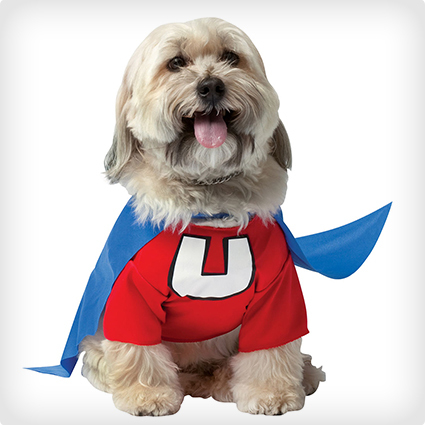 The costume features a red shirt emblazoned with the official Underdog U symbol and a blue superhero cape. 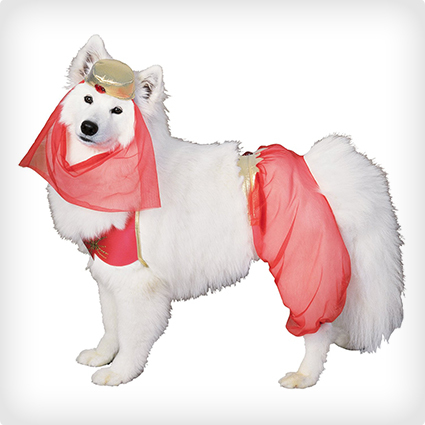 This adorable Harem or Genie costume for dogs will look fantastic on your girl! The costume comes with baggy harem pants, a bra style top and a little hat with a veil. Your dog is going to look exotic and mysterious in this lightweight mesh costume. The filmy fabric is light and delicate enough that it is not going to annoy your dog while they are wearing it. If you fancy turning your adorable little ball of fluff into a ferocious shark then this is the costume for you! 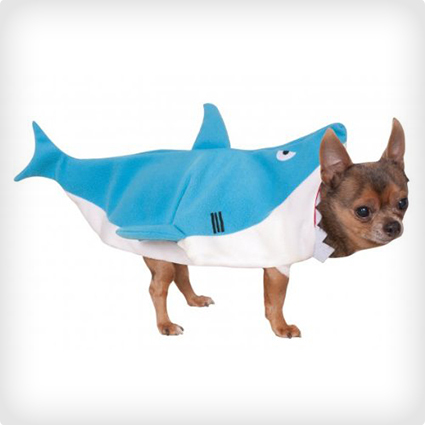 The plush shark costume is best for smaller dog breeds and consists of a shark shapred jumpsuit for your dog to wear. 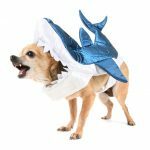 Your dog’s head can be sticking all the way out of the shark’s mouth making this more of a shark attack costume if you prefer, or it can be positioned so that your dog is the shark! This is a super cute costume, especially for tiny dogs! 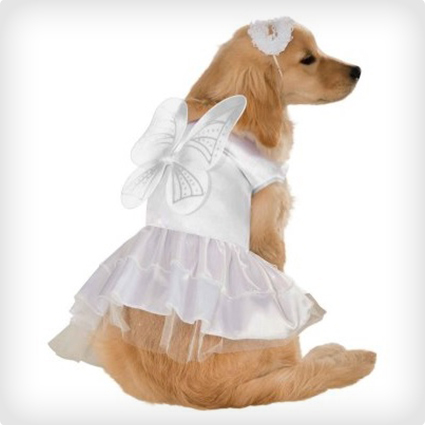 They say that dogs are heavenly creatures, so what better costume to choose for your canine chum than a stunning angel outfit? This adorable costume includes a a pretty white silk dress with an attached petticoat, small wings and a halo headpiece. The great thing about this particular angel costume is that the wings are not too large and cumbersome. They are small enough that they will not get in the way or irritate your dog. The last thing any of us wants is a dog running around with large wings sticking out and knocking everything over! One of the most adorable costumes we have seen is this cute Teenage Mutant Ninja Turtles costume! 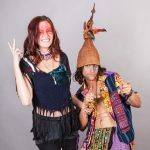 The costume consists of a printed, hooded jumpsuit with a detachable turtle shell. 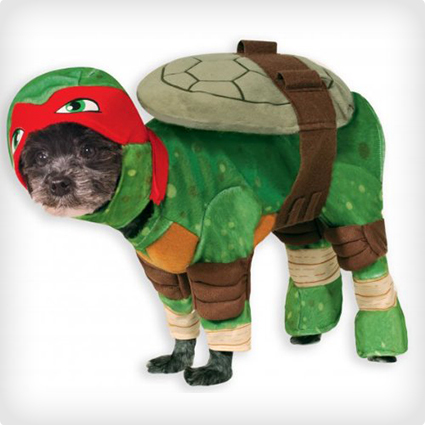 This particular costume is red, so it Raphael, but other colours are available if you prefer a different turtle, or if you have more than one dog you want to dress up! This costume made us laugh so hard! 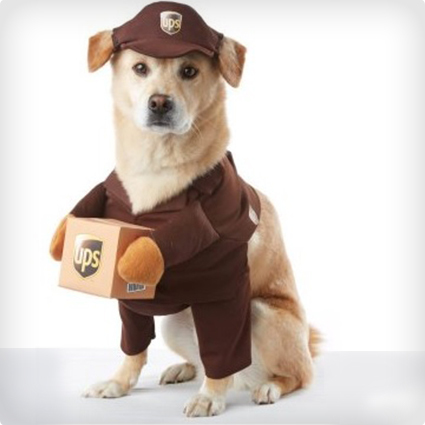 We all know that the stereotype is for dogs to chase mail men, so why not shake things up a bit this Halloween by dressing your dog in this adorable UPS Delivery Man costume? Isn’t it just the cutest thing that you have ever seen? The costume includes a UPS shirt with false arms attached to the front holding a parcel, and the traditional UPS ballcap! This is the cutest little vampire that we have ever seen! 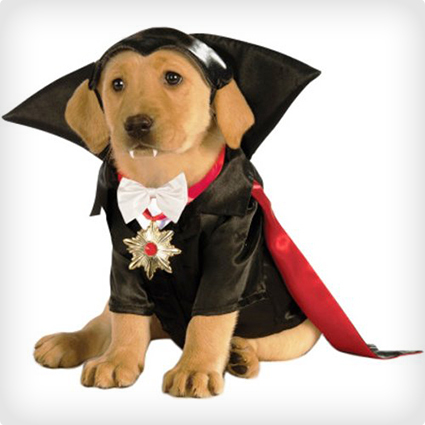 The Classic Movie Monsters Vampire Costume for dogs consists of a printed shirt, headpiece and detachable cap. We don’t think Dracula would have scared too many victims looking like this though, they would just think that he was super adorable! 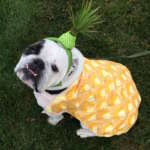 Sometimes, when it comes to choosing a costume for your dog, it is the simplest ideas that are the most adorable. This sweet pumpkin costume is more or less just a little hooded t-shirt, but it looks wonderful! 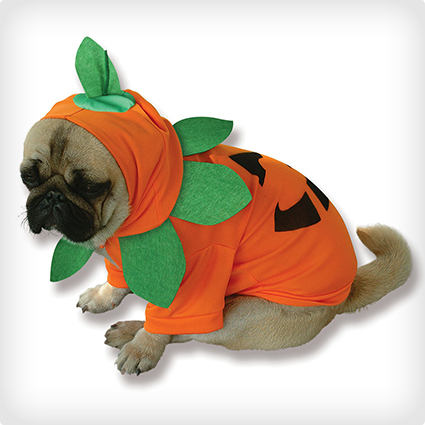 This is going to look best on chunkier breeds who are able to fill out the costume and create a rounder pumpkin shape! The costume is cut to be intentionally roomy to allow for a better range of motion making it more comfortable for your dog. What a cute police officer! 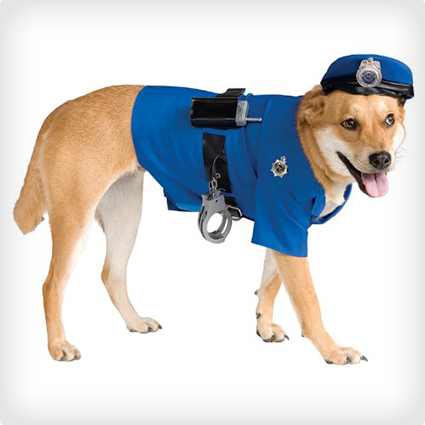 Your dog will soon be laying down the law at your Halloween party in this adorable police uniform! The costume includes a police shirt and hat, along with a belt featuring various accessories including handcuffs and a walkie talkie. All that is left is for you to teach him how to bark the miranda rights and he is all set! 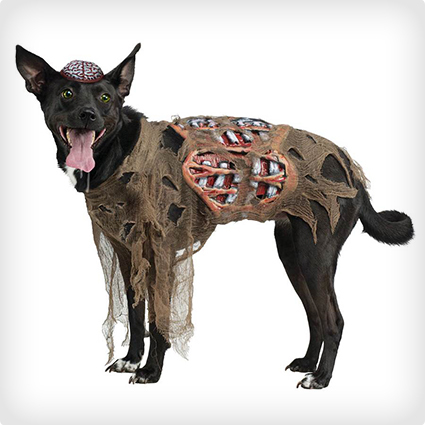 Your dog is going to scare more than just the mail man in this zombie costume! Never has man’s best friend looked more terrifying! The costume includes a ragged shirt along with a 3D belt with visible internal organs and a cool little 3D brain cap! 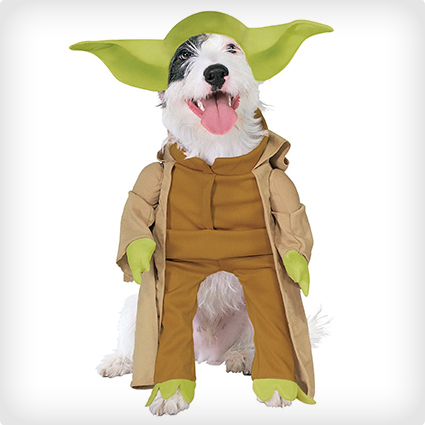 Star Wars fans are going to love this adorable Yoda dog costume! The costume is best for smaller breeds and features a cute doggy shirt with attached plush arms. There is also an adorable hat featuring large foam Yoda ears. Adorable he is when this costume he wears! Freddy Kreuger is one of the most iconic villains in cinematic history and some would say one of the most terrifying. 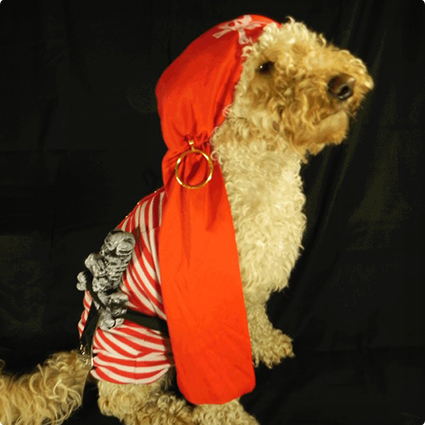 However, this doggy Halloween costume make Kreuger nothing short of adorable! This costume has some pretty amazing attention to detail. As well as the iconic black and red sweater, this adorable costume also features the traditional brown leather hat and the razor glove which fits around one of your dogs paws! When Tim Burton’s Corpse Bride returns from the grave, she brings with her a ghoulish pet in the form of a skeletal dog. 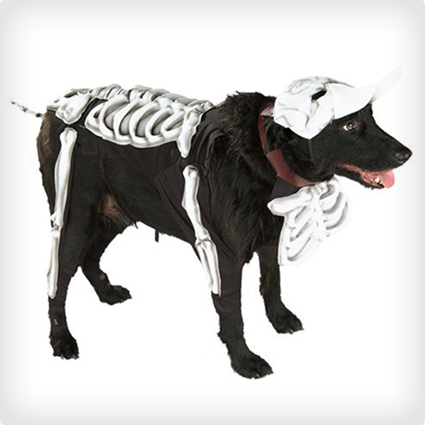 Now your dog can look just a ghoulish with this 12 piece costume. Each piece features a different plastic molded bone to attach to a different part of your dog’s body including a skull cap, tail bone, legs and rib cage among others! 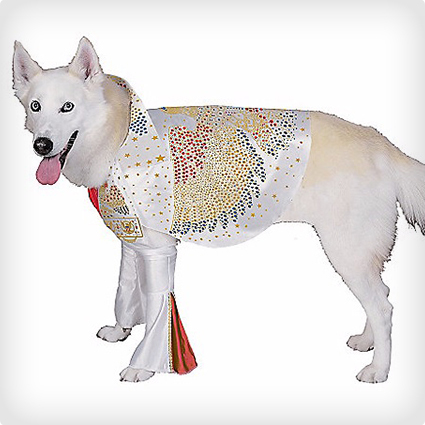 You can turn your dog into the ultimate hound dog with this glitzy Elvis Costume! Your dog will look and feel like a King for sure in this officially licensed Elvis shirt. The costume is modelled on one of Elvis’ most iconic outfits, the white rhinestone jumpsuit! If you really want your dog to be able to creep out your friends and family, then we cannot think of a better Halloween costume to choose than this fuzzy tarantula dog costume! We are still trying to make up our minds if this is adorable or downright terrifying! 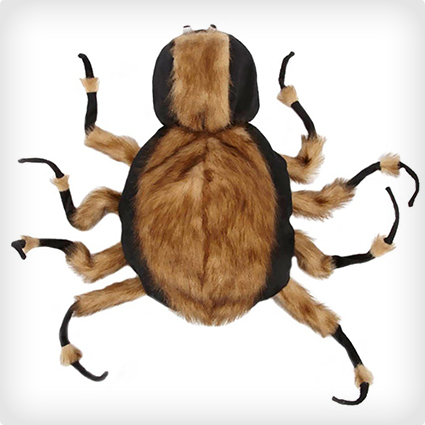 The plush bodysuit is designed to resemble genuine tarantula hair and the legs are bendable to allow for multiple poses! 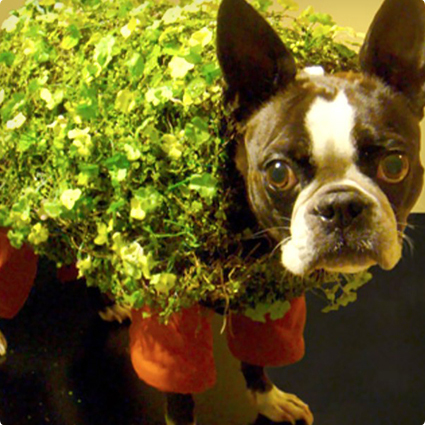 Just imagine your dog dressed in this scuttling around at your party taking unsuspecting guests unaware! Who doesn’t live minions? These adorable little yellow critters are already super cute, so when you combine them with an irresistibly cute dog, the result is just out of this world! 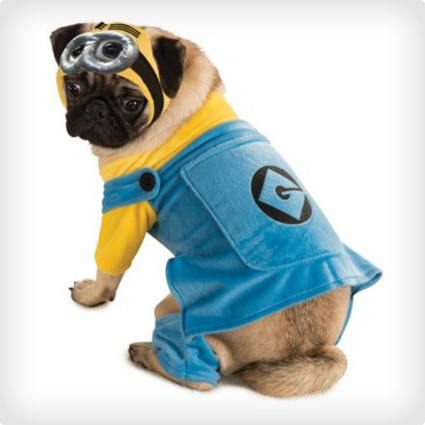 This officially licensed Despicable Me costume includes a minion jumpsuit and headpiece for your dog, allowing you to turn man’s best friend into villain’s best minion! Unless you have been living under a rock of late, you will know that Pokemon is stellar right now! 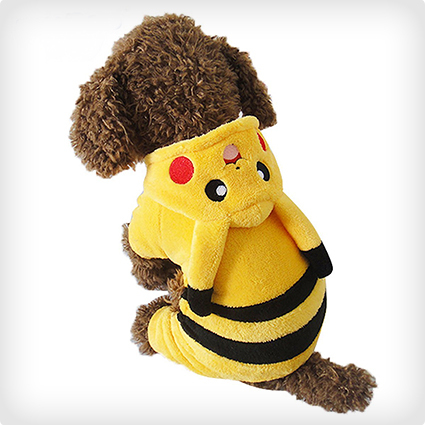 Why not stay right on trend with this adorable Pikachu Dog Costume and turn your furry friend into your very own real live Pokemon! The costume consists of a sweet coral fleece hoodie that you can also make use of all year round as a doggy coat for wet or cold days! Talk about getting great value for money! 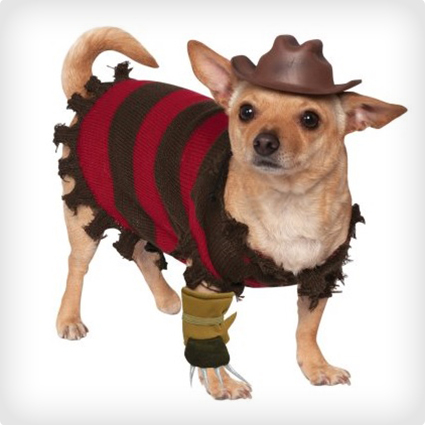 We have already seen a canine Freddy so it is only fair that we also give Jason Voorhees the same treatment! Again, we don’t think the horror icon would be quite so scary if he looked like this fuzzy little cutie! 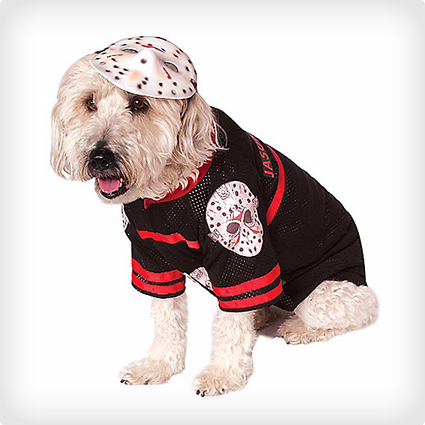 The officially licensed Friday the 13th costume includes a Voorhees hockey jersey for your dog and the iconic hockey mask! This is an amazing costume, but it is one that is really only going to work for taller breeds! 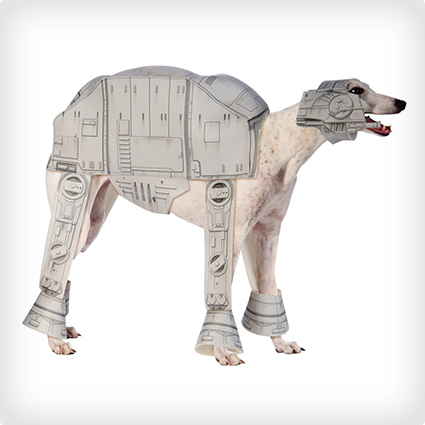 It is of course the Star Wars At-At dog costume! This officially licenses LucasArts costume includes a printed body armour and helmet which are designed to be lightweight and comfortable for your dog. We think it looks simply amazing! 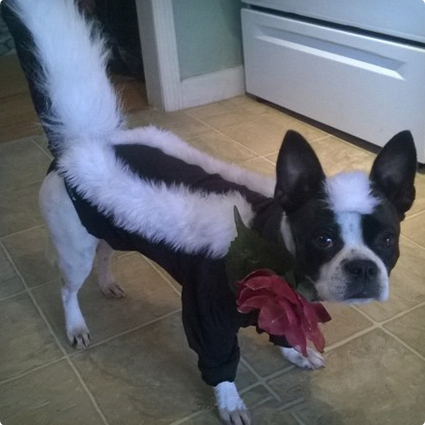 Beetlejuice is something of a Halloween classic film, so why not bring it to life in canine fashion? 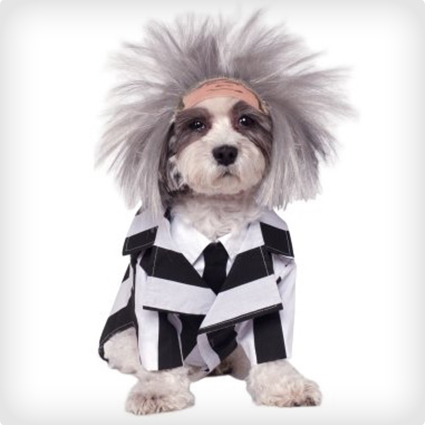 This awesome Beetlejuice costume includes the iconic black and white striped suit for your dog along with the the crazy Gray colored wig! Your pooch is going to be ready to raise all kinds of havoc! Another one for all those Star Wars fans out there. 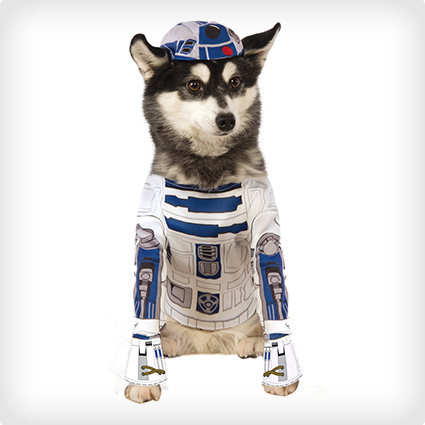 This time we have a R2-D2 doggy shirt with attached foot covers and matching hat to transform your dog into everybody’s favourite robot! This is best suited to small to medium dog breeds. 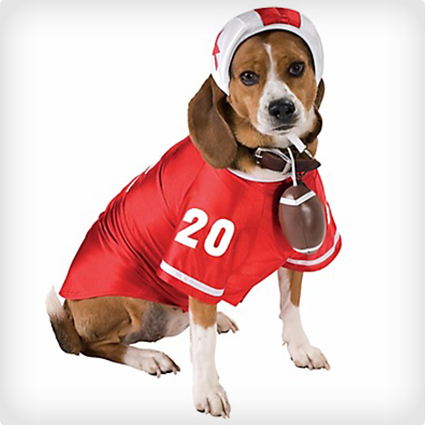 Show of your dog’s sportier side with this cute football player outfit! The bright red football jersey will stand out in the crowd and is teamed with a soft helmet which fastens under the chin. The final touch is a mini football which can attach to your dog’s collar – or you might just want to let him play with the ball instead! Who you gonna call? Well, you could do a lot worse than calling this doggy ghostbuster, that is for sure! 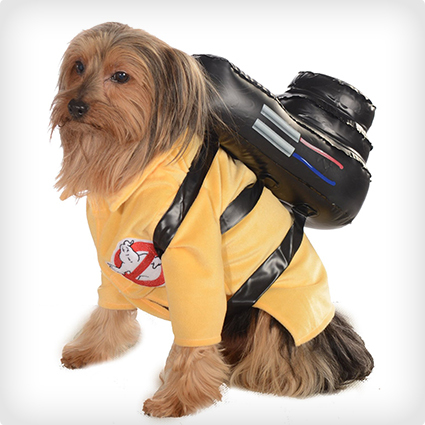 This is an officially licensed costume which includes a uniform shirt with the Ghostbusters logo and an inflatable proton pack backpack for your dog to carry around. Those spooks don’t stand a chance this Halloween! Some dogs just seem to love the water a little bit more than others. 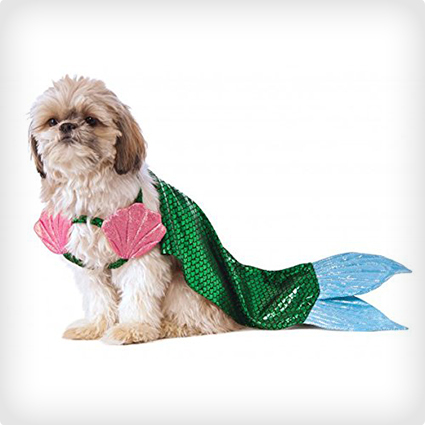 If your dog is one of them then maybe you would like this Mermaid dog costume! This adorable outfit has a metallic fish scale print tail with iridescent fins and a cute shell bra top. 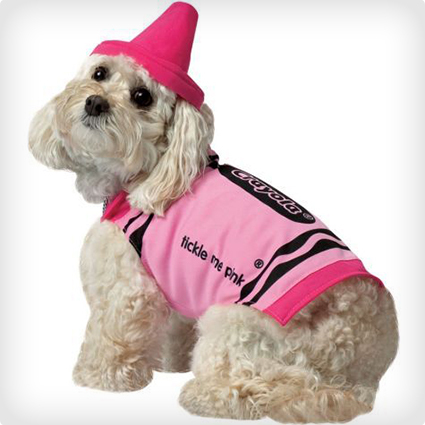 Let your dog brighten up the room with this cute pink crayon outfit! The costume features a printed doggy t-shirt to form the wrapper of the crayon and a cute pointy hat for the tip! This is super adorable and we have seen the human version of this too, so you could go as a matching pair of crayons which would be extra cute! 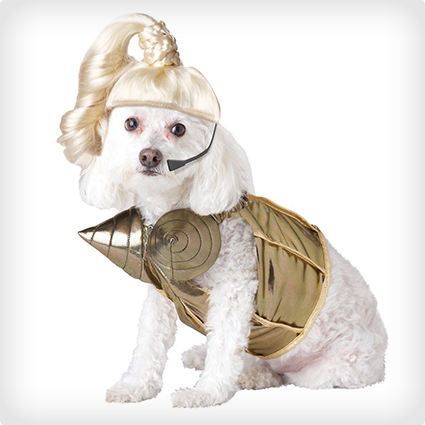 Get ready to cause a sensation in this adorable pop diva doggy costume! Depending on which era you grew up in this is either style on the Queen of Pop, Madonna or Mother Monster hersself, Lady Gaga! The costume includes a golden bodysuit with attached conical bra and a blonde wig with an attached microphone. Look at this little dinosaur cutie! It’s the tiniest little stegosaurus you will ever get to see! This adorable costume includes a padded foam body suit with spinal plates and spikey tails and a padded head piece too. If the stegosaurus costume isn’t doing it for you then maybe you would be best trying a different dinosaur. This printed foam Raptor costume if equal parts ferocious and adorable! 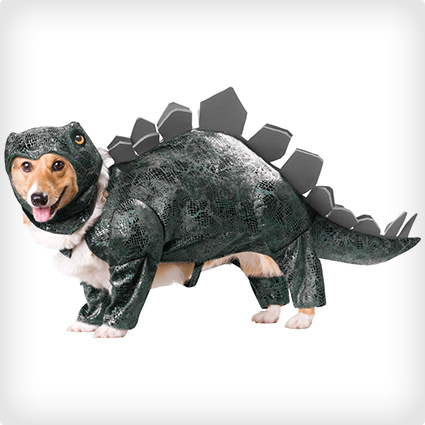 Your dog is sure to be the talk of the party in this dinosaur get up! 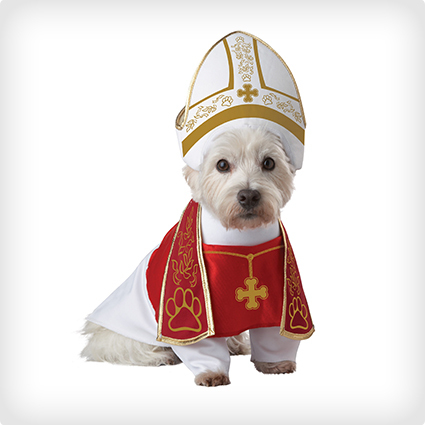 If you have faith in your pup, then you are going to love the Holy Hound dog costume. We think that this would match perfectly with your own outfit if you are intending to dress as a nun or a priest. The outfit includes a printed red robe with a detachable stole plus an adorable little mitre headpiece. 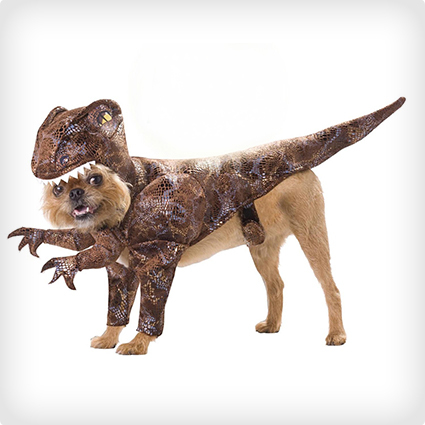 This costume is really going to help your dog to stand out! 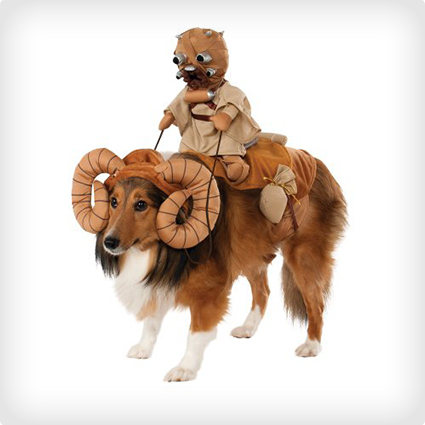 Star Wars fans are going to love the Bantha Rider Pet Costume. The headpiece features a set of curled horns, while the saddle piece has a stuffed rider attached to make it look like he is riding on your dog’s back. He will look absolutely adorable. 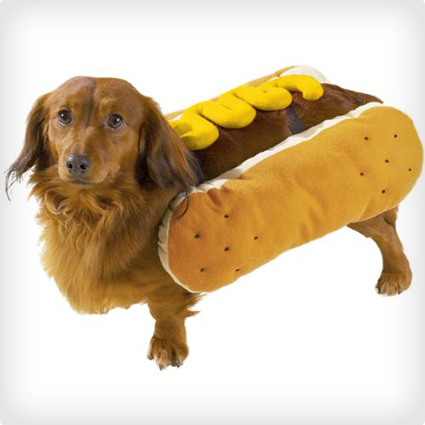 With this adorable costume, any dog can become a hot dog! If you have a bit of a twisted sense of humour then you are going to love this costume and we think that it is especially perfect if you have a dachshund! The costume consists of a foam bun jacket with mustard down the back. A ketchup version is also available. 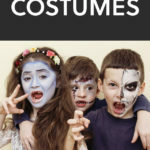 You have probably noticed that this list of costumes is pretty Star Wars heavy, but that is because not only is this an incredibly popular theme, but also the costumes are just so darned cute! 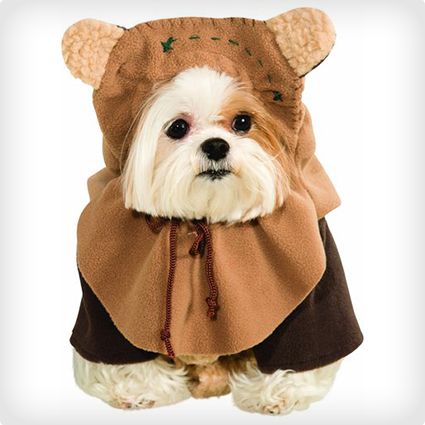 Just look at this sweet little Ewok costume for dogs if you need proof! This is best for smaller dogs like pugs and Frenchies and it includes a little doggy jacket and headpiece hood with faux ears. 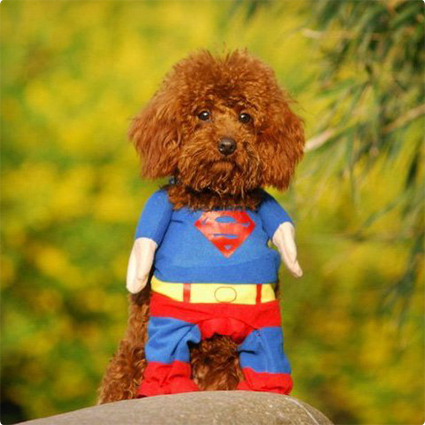 Everyone believes that their dog is a superhero, but now they can go ahead and prove it with this cute Superman style costume. The costume is a single piece jacket with a build in cape and attached false arms to give the illusion of a tiny upright superhero. It is also very reasonably priced. This has to be one of the most unique dog costumes that we have come across. 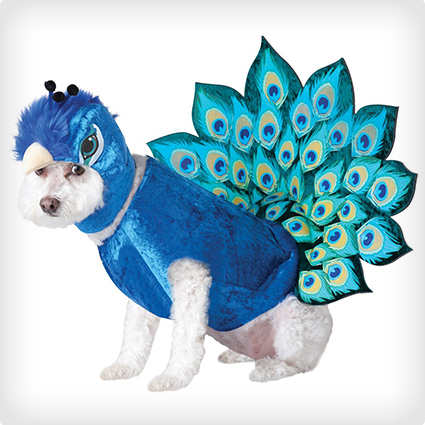 Turn your pooch into an adorable little peacock with this Animal Planet costume. The bodysuit is a soft velour fabric in a vibrant blue with a built in ‘skirt’ of printed peacock feathers. There is also an optional headpiece with eyes and a beak included if you want to put that on the dog too, but the costume is fine without if your dog will not tolerate a hat. 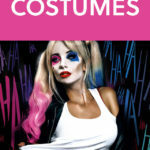 This costume is not just great for Halloween, but also summer parties, barbecues and luaus. 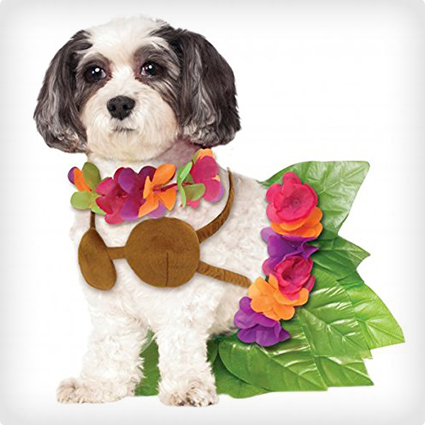 The Hula girl costume has a skirt made from palm leaves, a coconut look bra top and a flower lei to fit around your dogs collar. If you are looking for a DIY outfit for your dog, or if you need something last minute then one of the easiest options is to make a doggy tutu! This is a cheap and easy project that requires only a roll of tulle and some elastic. 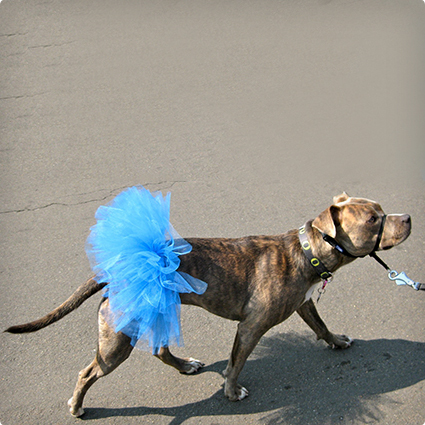 Your dog could wear the tutu alone, or it could form the basis of other costumes. You could add some wings for a fairy outfit the only limit is your imagination! 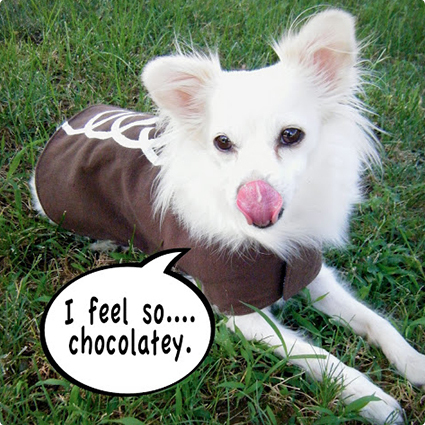 Another easy DIY costume for your dog is this cute little coat to turn your pet into a delicious Hostess cup cake! All you need is some brown fleece fabric and white fabric paint. You will need some basic sewing skills, but it does seem like a very basic pattern to follow. 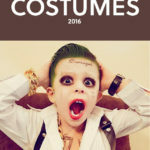 This is a really creative little DIY costume, but it does require some time and a lot of creative talent. 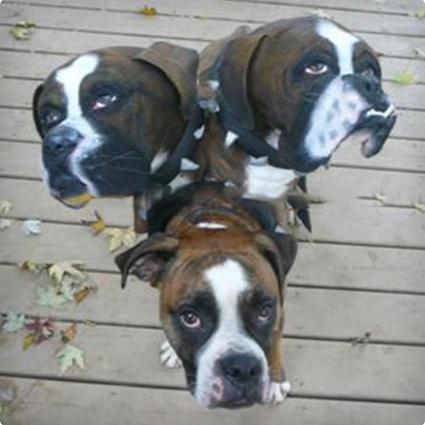 The costume uses plumber’s pipe insulation to build 2 heads resembling your dog’s own head which can then be attached to his or her back to create the legendary triple headed dog from the underworld! Pirates are always a popular outfit around Halloween, and they are incredibly easy to make if you want a DIY option. This one is a no sew option, so anyone can make it with ease! It uses a striped tank top, a hot glue gun and some dollar store accessories. The result is beautiful and looks like you spent a lot of money on it! Do you remember Chia pets? Now you can have a real live one with this clever DIY costume for your dog! It looks incredibly complicated, but you will be surprised at how easy it is to make. You just need to glue some of those fake aquarium plants onto an existing doggy sweater and make some plant pot leg warmers! 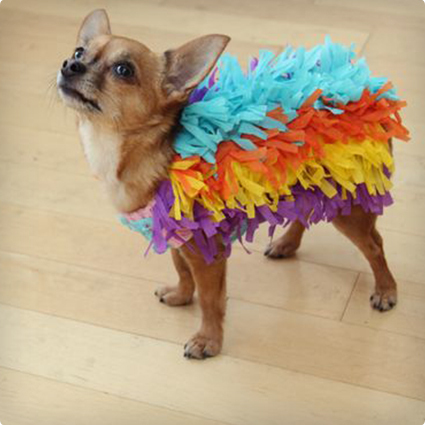 Another easy DIY costume which re-purposes an old doggy sweater is this cute Piñata costume! All you have to do is glue strips of fringed crepe paper to the sweater and top it all off with a mini sombrero and you have a simply adorable doggy Halloween costume that everyone is going to love! 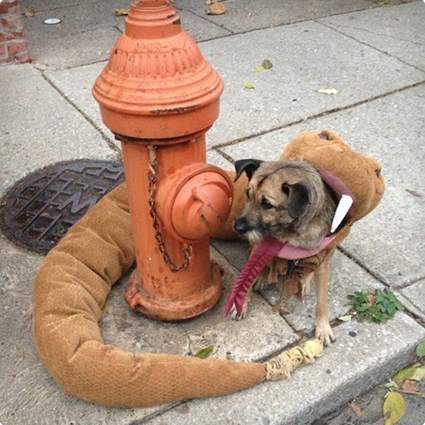 This clever DIY costume doesn’t just turn your dog into a rattlesnake, it goes one step further and makes it look as though the snake is actually devouring your dog whole! This is probably going to look best on a smaller breed – otherwise you need a huge snake! It is largely constructed from cardboard and duct tape! 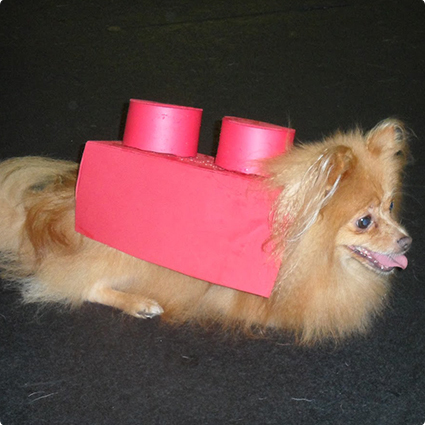 If you are looking for a cheap and easy DIY costume for your dog that you can rustle up last minute, then you are going to love the lego brick costume! All you need is a bunch of cardboard boxes and solo cups which you probably already have around the house! This Wile E. Coyote outfit is super cute and is really easy to make. 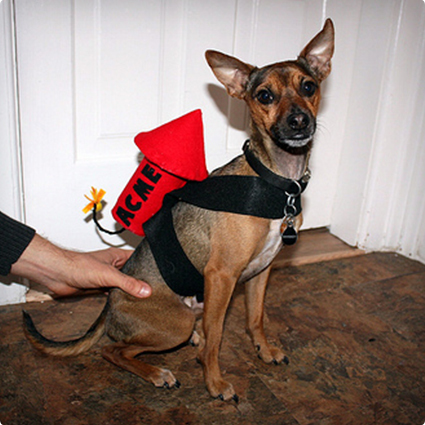 You can use junk from around your house to create an Acme rocket to strap onto your dog’s back! This particular one uses a soda can, a beer bottle and some scraps of fabric! Remember Flower the Skunk from Disney’s Bambi? 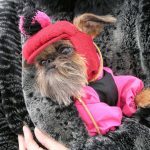 Well, this adorable dog costume looks the part and is so easy to make using an old baby romper and some faux fur trim! It is certainly adorable and will get plenty of compliments! 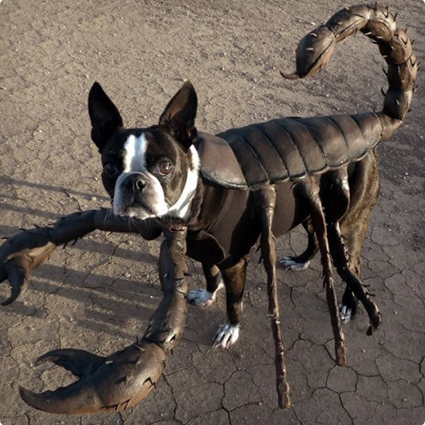 If you have some skill with a sewing machine and a little bit of artistic flair, then maybe you will like to attempt this DIY scorpion costume for your dog! It is based off of a thunder shirt and uses wire and latex to add the legs, stinger and claws!